Have you ever heard of the Austrian car marque Puch (pronounced like “POO-KH”)? The company used to slap its badge on all Mercedes G-Class cars sold in Austria, Switzerland and Yugoslavia (and some other countries). Many of these “Puch G” off-roaders entered military service with only minor modifications to differentiate them from the base G-Class. Some time ago, car tuner Lorinser acquired a number of these vehicles for extensive restoration and modernization. The car you may see on the images here came out in 1993. The team over at Lorinser painted its body matte black with red tarpaulin cover and red faux leather trim for the interior. Each restomodded G-Wagon/Puch G by Lorinser sports a set of stout 16-inch wheels wrapped in Goodrich off-road rubber, modern suspension, new LED-based auxiliary headlights, a heavy-duty winch and a trailer hitch. Finally, for that trailer hitch to actually be usable, the tuner devised a major upgrade for the car’s 116-hp / 87-kW engine. We don’t have any precise numbers to go by, though. 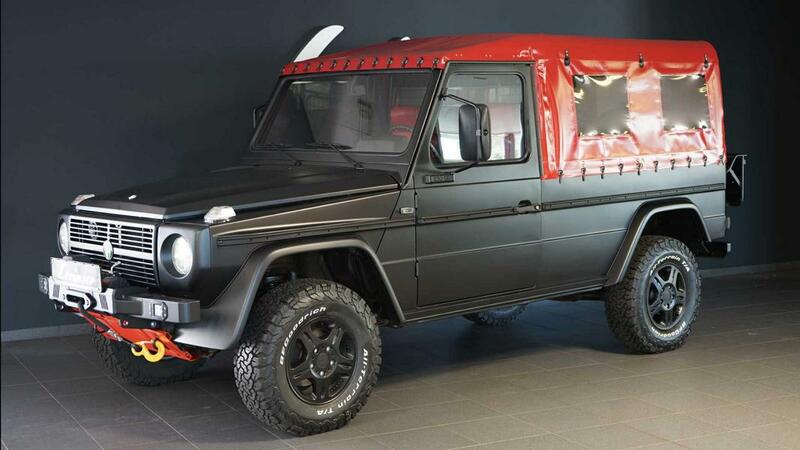 All Mercedes G-Class/Puch G by Lorinser received the same or similar modifications and are now up for sale.